Luxury, convenience, relaxation: Exceptional comfort wherever life calls you.The world leader in luxury bus conversions, our craftsman have created more than 1,250 unique coaches spanning over 30 years for customers across the globe. We’ve created almost every imaginable option and offer a wide array of features. From Marathon’s revolutionary bunks-to-wardrobe feature to our patented TechLink “electrical smart house control system,” we’re proud to create the most advance coaches on the road today. Unlike many motorcoaches where overnight guests are an afterthought, we can provide bunk beds, each with its own audio/visual system so everyone has his or her own space. The innovation comes along when traveling without guests. With the press of a button, the upper bunk lowers down to the bottom, clearing the way for a large wardrobe. It’s there when you need it and maximizing storage when you don’t. 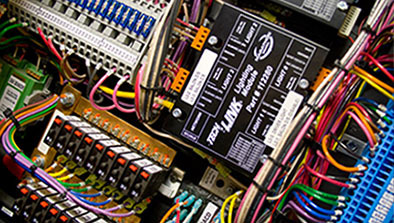 TechLink is Marathon Coach’s smart house control system designed to set the standard of performance and reliability. TechLink’s sophisticated system examines, monitors and controls essential coach information and shows it where you want it: iPhone, iPad, remotes and displays. We continue to develop this technology so you can enjoy the peace of mind of monitoring and controlling your coach’s functions from anywhere. Whether for reasons of sheer comfort or those of practicality, for people who choose this option, the king-size bed can adjust to the perfect lounging position for maximizing the action and adventure playing out on your private, high definition television. However, this configuration can also allow people to easily maneuver past the bed to the back wardrobe even when the slides are in. Marathon’s Crestron system is a control system designed with ease of operation in mind. Take the theater button for example. All you need is the popcorn, because with one simple touch of the hand-held control, the system automatically closes the blinds, dims the lights, activates the Blu-ray player and turns on the surround sound. Grab a seat; it’s show time! There’s no shortage of fun with your Marathon’s outdoor entertainment bay. Whether you’re looking to become the MVP of your tailgating circle, setting the stage for romance as you plan a sunset viewing of your spouse’s favorite flick or letting the kids watch that Disney movie for 210th time, your entertainment bay flawlessly meshes movies, music and programming with lush natural surroundings. Air pocket doors do more than add charm and maximize space. 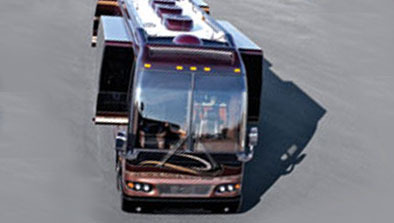 The “headerless” installation allows for expanded height clearance, while the smoother operation from our rodless air cylinder ensures you can move about without disturbing others in the coach. Easy to maneuver and aesthetically pleasing, pocket doors provide the fit and finish to enhance your motorcoaching experience. Did you know that a skilled team of craftspeople custom builds each sofa, chair, valance, wall, ceiling, cabinet and more for every luxury coach from scratch? The furniture is custom built using the highest quality of wood and fabric materials available. The walls, ceilings and cabinets are created to uphold the highest standards in design and functionality. 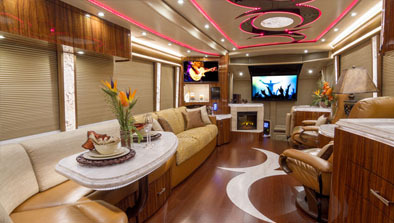 This stringent attention to detail and flexibility of design is one of many aspects that elevates your luxury motorcoach from ordinary to extraordinary. With thousands of colors to choose from, the possibilities are endless! 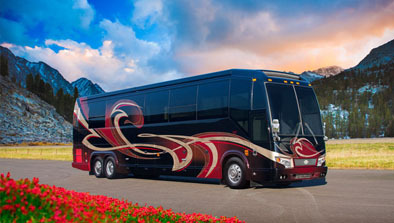 Marathon’s exterior designer will work with you to create a unique paint concept for your coach. Our artists and craftspeople employ custom techniques to achieve an array of special effects including ghosted images, marbles, textures and shadows. Our experts can even create “candied” details that capture light, showcasing stunning color and sparkle. No matter what effects you choose, your design will be a piece of art. 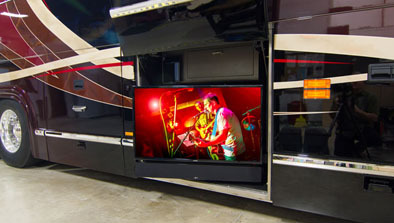 Slide technology allows for a roomy floorplan providing a comfortable environment for family living and entertainment. Marathon owners who tend to stay in the same area for long periods of time tend to appreciate quad-slide floorplans with augmented space. Others who actively travel the often find triple-slides a better fit as they can more easily transverse the coach with the slides in. Choose one of Marathons diverse floorplans or design your own.